Kirby Muxloe dominated the recurve section at the East Midlands Indoor Championships on Sunday. Shooting a 3 spot WA18 metre round, Ben Trudgill, Lizzie Warner and Mark Bennett beat off all rivals to secure the team title at Rainworth in Nottinghamshire. 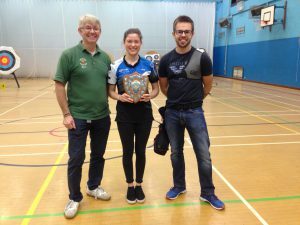 Ben also won the Men’s Recurve title and Lizzie the Women’s, with a score of 578 that broke the county and regional records for a senior woman. A clean sweep for the Kirby archers, a feat we’ve never achieved before at a Regional Championships. Not to be left out, Mark won a handicap medal to ensure that all three archers came away with an individual medal.